Price: $5.99 $11.99 50.04% off i The regular prices might have a slight change due to amazon seller's control. INSTANT ACCURATE READING - Simply insert the tip of the probe into your food or drink and within 4 seconds, you will have an instant temperature reading displayed on the large dial of the thermometer. The 4 inch food grade, high quality needle tip probe guarantees an accurate temperature reading to ±0.9°F (±0.5°C) NOTE: temperature range：-50℃~300℃（-58°F~572°F）If the temperature is out of this range, ‘LLL or HHH’ will show on display. PERFECT FOR INDOOR AND OUTDOOR USE - Avoid overcooking or undercooking your food by using this BBQ thermometer from SUNAVO. With perfectly cooked beef, chicken, pork, fish, lamb and turkey this thermometer also works great with beverages, deep frying, making candy and breads along with heating water, milk or even water for showers. WARRANTY: We provide you with a 30-day hassle-free return policy and 12-month warranty. Flexible Worth the price. Easy to use I purchased this to use with my smoker. It arrived quickly and was easy to use. The measurement seemed accurate and it was quick to measure. I like that the magnet allows me to attach it to my worktable or the side of the smoker when not in use. 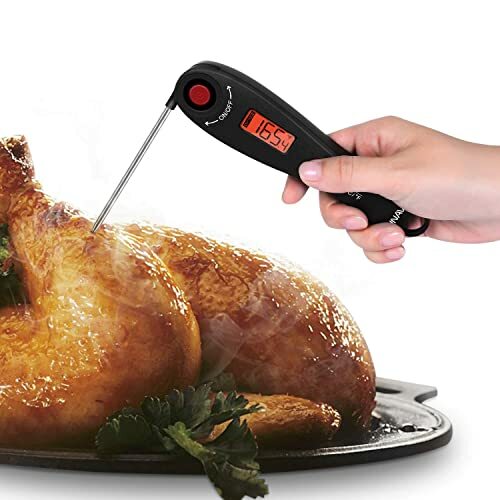 Hey,come to try MT-23 Digital Instant Read Turkey Meat Thermometer with Backlight,Kitchen Cooking Food Candy Thermometer with Foldable Probe for BBQ Grill Smoker Baking,Christamas now.It's a trial rebates.